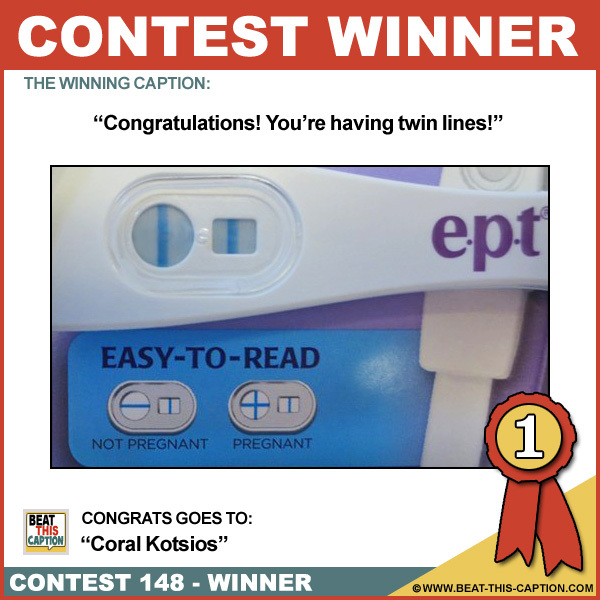 Beat This Caption Contest 148 Winner – Caption Contest Funny Clever Witty Enter Today! I told you if you stand up you can’t get Pregnant! Congratulations! You’re having twin lines! Ha! Quick, bring me a Straw… :) You WIN! If you turn your head sideways, it kinda looks like WALL E ! I told you we shouldn’t have done it standing up! I screwed you so hard the baby is upside down!!! Hello, Mom!…are you available for babysitting?